At the very heart of the spirituality of St. Alphonsus is love: God’s love for us and our love for God in response. St. Alphonsus was overwhelmed by God’s love for him and for all of us, and for Alphonsus, this was especially manifest in Jesus. Jesus is the unshakeable sign and proof that God loves us. 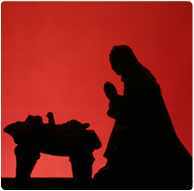 The spirituality of St. Alphonsus has traditionally been summarized in the four symbols of the crib, the cross, the altar, and Mary. This Advent season, we’ll take the time to reflect on the crib. Each week’s reflection will focus on a different theme related to the birth of Jesus—in time and in our hearts this Christmas. What would you think if you saw a neon sign flashing, “In Him is plentiful redemption,” and its meaning really hit you? Does a deep sense of wonder move your heart as you ponder the vulnerability of Jesus in the crib and on the Cross? Jesus accepted the will of the Father to preach the kingdom, for which he died a cruel death on the Cross. God accepted his Son’s willingness to become human and to be like us in everything but sin. Jesus’ loving obedience to the Father and to God’s loving plan for all people, is the focal point of Christ’s Incarnation and our redemption accomplished by his death on the Cross. Would an overwhelming sense of amazement capture your heart as you consider the awesome mystery of the Incarnation and then, the Passion and death of Jesus? Jesus’ time as a human being, from birth to death, was spent in simplicity and poverty, in humility and vulnerability. When Jesus came as a newborn baby, he was born into all the complications of life and faced the same challenges we do. He experienced all our human needs. Jesus knew our pain—the pain of being rejected, unloved, unwanted. Finally, Jesus knew human suffering and brokenness in his death. It is in this self-gift of his death on the Cross that we are redeemed. Perhaps in awe, wonder and amazement we are all challenged during this time of Advent. Challenged by John the Baptist to a change of heart, to face the challenges in our lives with faith and love; not alone but with the grace of God. It is with this change of heart that we prepare for Jesus’ birth, and come to know the redeeming love of Jesus by his death on the Cross, for … in Him is plentiful redemption. Sister Mary is a member of the Redemptorist Mission Team with Father Paul Bryan. She is a member of the Bernardine Franciscans, an international congregation whose motherhouse is located in Reading, Pa.